G.I.JOE: Retaliation has hit theaters and the early word I’ve heard about it so far is positive. The movie looked far more G.I.JOE-like than the first movie (which wasn’t bad, but mismanaged a few characters) from the get-go, so here’s a small Joe-themed update to celebrate that. 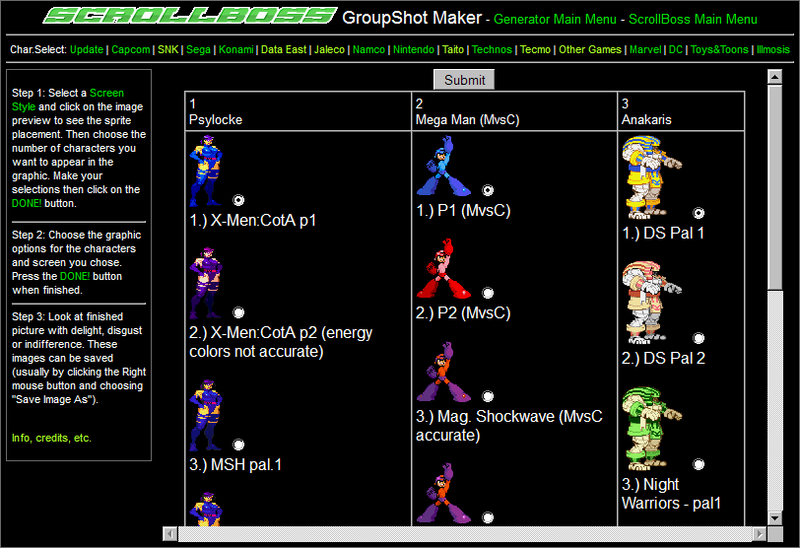 Custom Sprites – Beach-Head, Firefly, Jinx (masked, unmasked and blindfolded), Zartan added to the G.I.JOE page. Mini-Logos – G.I.JOE ARAH (with tiny tagline under the main logo), The early Japanese ARAH-style logo, Cobra (IDW), Action Force (yellow stencil, and ARAH-looking versions) and Dreadnok (from the 7 pack of figures) added to the G.I.JOE section. GroupShot: 88×136 Comic now has some of the Marvel G.I.JOE comic set-ups. Sprites – G.I.JOE page added with the playable characters from the first NES game and some cinema gifs from the arcade game. Game Index – Konami’s G.I.JOE arcade game was added to the index. GFX Generators There has been a major change to the menu set-up. Palette selections are no long found underneath the sprites on the second menu page. Don’t panic! Select everything else and go to the next page just as before. You’ll now see a new page to select the palettes, but with previews of the sprites to go along with them! The old system was just to avoid making another menu page. It might seem wasteful to have another page, but there will probably be new features (portrait palettes, eventually) added to the engine that would work nicely on this new menu page. Currently has Archie (with Capcom and Sega logos), DC 1980s, Marvel 1980’s, and Udon (Capcom). There’ll be more new cover set-ups like this in the near future, but let me know if there are any that you really, really want to see. Mini-logos – Black Tiger added to the Capcom section, Dark Adventure & Violent Storm added to the Konami section. DC (swirl), Justice League of America (original), Justice League (Giffen/JMD/Maguire era stencil 2), Static, Teen Titans (1980s) added to DC section. Marvel, Fantastic Four added to Marvel section. Bravoman (TG-16 style) added to Namco section. Ninja Warriors and the New Zealand Story added to Taito section. Note: the new sprites and mini-logos were added to the GFX Generators, too. Game Index – Black Tiger (arcade) updated and fixed. I (finally) have LittleBigPlanet 2 for the PS3 and I’ve been enjoying it for about two weeks now. If you’re on the LBP.ME site, check out my page at scrollboss. I have a lame LBP1 test level and a LBP2 comic book logo/symbol shape giveaway level right now. I’ll eventually have a similar giveaway stage for game-related items for things that aren’t SMB, Sonic and the other things already heavily represented in LBP. Heads up! In honor of G.I. JOE: Retaliation hitting theaters soon, a small G.I.JOE-themed update will hit next week. Yes, updates two weeks in a row! Expect to see new G.I.JOE and Cobra custom sprites along with some other Joe-related things. Last, but certainly not least, Happy Birthday to Flying Omelette, owner of the Flying Omelette game site with shrines and an oddity section with more more weirdness than five Minus Worlds stuck together with Crazy Glue!